So to this account, which is structured in a number of geographical Sections. 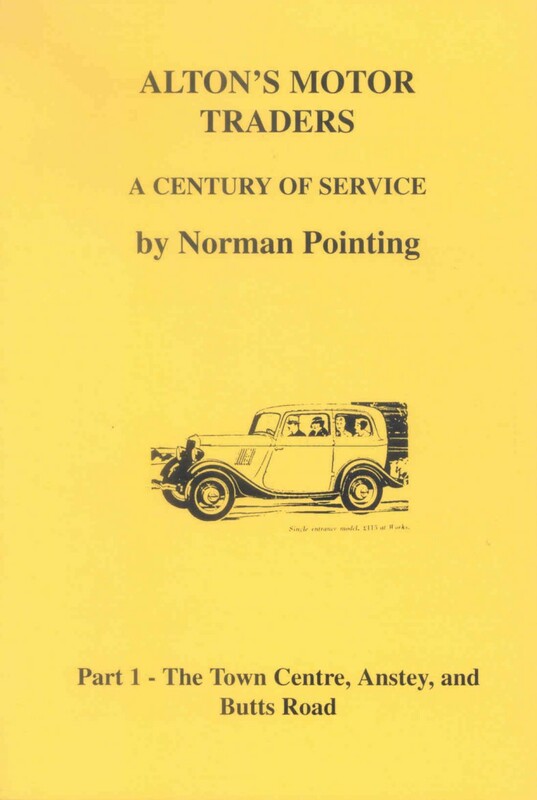 It starts with the briefest of resumes about the beginnings of the motor car, together with a few memories of early car ownership here in Alton. Then follows a short account of the origins of the motor trade in Alton. But how, then, to present the mass of information about the various traders that had been assembled? My first inclination was to record firms in chronological order of their date of origin: this proved to be meaningless, just a muddle, since some firms were in existence for only a few years whilst others were to operate for decades. Fortunately, an alternative pattern was emerging. As to be expected, quite a few of Alton's early motor traders began business in the centre of the town. Then it became apparent that all the various garages and the like had, in fact, been at certain specific locations and addresses for a great number of years, whether in one ownership or with a succession of proprietors. So it is this location pat tern that I have adopted in this history. Now back to the very beginning. Gottleib Daimler and Karl Benz are generally regarded as the creators of the motor car, in 1885 building and running their first petrol-driven car. Eleven years later, in 1896, Frederick Lanchester produced the first advanced, reliable, British model. The following years saw a boom in car ownership in Britain and worldwide. It is generally taken that the first car witnessed in Alton was a Lutzmann, around the close of the 19th century. In 1862, Adam Opel - the pioneer of the famous German car firm - had transformed his small engineering business into one building state of the art machinery, including sewing machines and bicycles. In 1899 he signed a contract with a farmer, Friedrich Lutzmann, and together they set up an automotive manufacturing factory in Russelsheim. Adam's sons had already been working closely with Lutzmann for two years, and 1899 saw their first production model, a Lutzmann. The first Alton person able to drive a motor car was, it is claimed, Harold Foster, although he never owned a car of his own (see Part 2). In 1902, Harry and Harriett Colston were to be seen riding in the front passenger seat of a car owned and driven by Harriet's brother-in-law from Surrey. This car was a Locomobile made by Stanley Bros of the United States. The Colstons ran the Rising Sun public house at the lower end of Nether Street (the then notorious lane beside the present Magistrates' Court). Another well-known early car in Alton - in the 1910s - was that of Dr GM. Jones of Rawdon House, 78 High Street. By the 1930s, the sight of cars in Alton no longer turned heads. Exceptions, however, were Mr Gerald Hall's Silver Ghost Rolls Royce purchased in 1914 and his striking white two-seater, a 1909 French Darracq. In 1901 Adam Opel had split with Lutzmann and signed a contract with Alexandre Darracq to produce French Darracqs under licence, the vehicles having Opel bodies on Darracq chassis with a 2-cylinder engine. The local Alton demand for motor cars increased steadily, and many motor trading firms sprang up in the neighbourhood. Several were created by "entrepreneurial engineers" whilst a couple evolved from existing (horse) coachworks. However, the majority originated in cycle and motorcycle shops and works. In the early part of the 2Oth century there was a plethora of cycle and motor cycle shops in the heart of the town -in Market Street, in Market Square, in the High Street and along into Normandy Street. A number continued to prosper for the next decades. Some continued essentially as cycle shops. Some withered away. However, several of those cycle shops, ones that from the very outset had dabbled in the sale and maintenance of the new-fangled motor car, went on to become significant players in the motor trade of Alton. As to who was the very first motor trader in Alton, truth is now clouded in the mysteries of time. But read on, dear reader, and as this story unfolds. some clues will be revealed. Please contact the publisher if you would like to share information on the contents of this book.